NopCommerce vs WooCommerce - Which E-commerce Platform is the Better Option? Launching a new e-commerce business can be a hassle. You need to do a ton of research which takes effort and time. One of the most important things you need to research is the platform you will use for your online store. Choosing an e-commerce platform that supports multiple payment and shipping methods and offers a variety of marketing and sales tools is essential. However, in order to find the option that works best for you, you also need to consider your business needs and objectives. For example, if you want to sell subscriptions, you need a platform that supports recurring products. Or, if you want to rent out specific products, you need to choose a platform that supports rental products. No matter what your business needs and goals are, finding an e-commerce platform that provides all the necessary functionality can be hard. But given that you’re here, you most likely have narrowed your choice down to two of the major e-commerce platforms out there - nopCommerce and WooCommerce. We know that evaluating one platform’s features and capabilities can be very time-consuming. Let alone comparing two platforms. This is why we will give you a bird’s eye view of nopCommerce and WooCommerce. We will discuss their architecture, features, add-ons, pricing plans, and more so that you can define which one is better suited for your business. So, get comfortable and let’s get started! NopCommerce is an open-source .NET Core e-commerce platform. It is suitable for businesses of any size. From small-size online stores to corporate level multi-store retailers. ASP.NET CORE. NopCommerce is built on top of the latest ASP.NET Core meaning that at its foundation lays one of the most popular, robust, highly scalable, modular and performant, open-source frameworks that is backed by the ASP.NET team at Microsoft. Open-source. NopCommerce is community-driven, which means that it leverages the power and work of many developers and partner companies. As such nopCommerce is actively being developed and new features and improvements are being added to it constantly. Extendable architecture. Themes and plugins can be easily developed without any interference with the platform’s core architecture. This means that there is an easy and structured way to extend the platform with whatever capabilities you need. Security. Being an ASP.NET CORE application, nopCommerce is one of the most secure e-commerce platforms out there. In the 10 years of its existence, it has seen only one security patch and no reports of security breaches whatsoever. RESTful API plugin that allows you to access and manage your nopCommerce website’s data (customers, products, orders, etc.) through an easy-to-use HTTP REST API. The RESTful API plugin is developed by Nop-Templates. You can download it for free by clicking here. Multi-store support. You can create and configure as many stores as you want. All stores share one database. Thus, managing them will be a breeze. In addition, your customers will be able to log in to all of them using the same credentials which significantly improves their overall customer experience. Multi-vendor support. You can create a marketplace and allow other vendors to sell their products on your website. Single management portal with a responsive design. Easily manage your e-commerce business from your office, or on the go. Responsive design for the public area of your store. People browse and shop online on their phones while waiting in line at the supermarket, or having their afternoon coffee. It’s 2018 and having a mobile-friendly online store is a must. Multilingual support including RTL (right-to-left) support enables you to reach customers all over the world. SEO friendly markup, URL slugs, canonical URLs and sitemap support guarantee that Google will love your store. Reward points-based loyalty program helps you nurture long-lasting and valuable relationships with your customers. Anonymous checkout. By offering this feature, you are sure to never miss a sale because a first-time buyer is in a hurry and doesn’t have the time to register at your website, for example. Note that nopCommerce doesn’t offer one-page checkout out-of-the-box. If you want to add such feature to your store you will have to purchase a one-page checkout extension. Tax configuration with VAT support. This will come in handy if you sell your product to companies or customers who live in countries where VAT applies. Integration with more than 50 payment gateways among which PayPal, Square, 2Checkout, Skrill, etc. Additional payment options including credit card, cash on delivery, in-store pickup, and more. Microsoft Azure integration. Build and run your online store directly in the Microsoft Azure cloud. Rental products. Store owners not only can sell products but also can rent them out. Recurring products. Shoppers can subscribe to a product or service for a specific period of time and pay on a weekly, monthly, or yearly basis. Related products. Shoppers can see products that are similar to the one they intend to purchase. This gives you the opportunity to upsell without being too intrusive. Wishlists. People can create a list of all the products they would like to buy from your website. When their birthday is coming up, for example, they can send their wishlist to their family and friends. This way they are sure to receive a gift they will truly love. These are some of the more significant features nopCommerce offers out-of-the-box. Note that since the platform is open-source, you can easily add more advanced custom features to your store. You can also fully customize the way your website looks and feels. As a result, it can perfectly match your brand identity. Even if people don’t always judge books by their covers, they will most likely judge your store by its design. After all, who would buy from a website that looks outdated? Lucky for you, you won’t have to worry about this. NopCommerce offers a wide variety of great looking themes. You can find 170 themes in the nopCommerce marketplace (119 commercial and 51 free themes). Having so much choice gives you a much better opportunity to find the perfect theme for your store. You can find a theme that was built specifically for the type of products you offer - electronics, clothes, sports gear, jewelry, beauty products, toys, home decor, and so on. One that matches your brand identity and offers all the capabilities you need to successfully run your online business. Aside from design, capabilities, and cost, there is one more thing you should consider when choosing a theme for your store - that it is compatible with your version of nopCommerce. Note that there are 29 Nop-Templates themes in the nopCommerce marketplace. They come with a set of 13+ premium plugins. 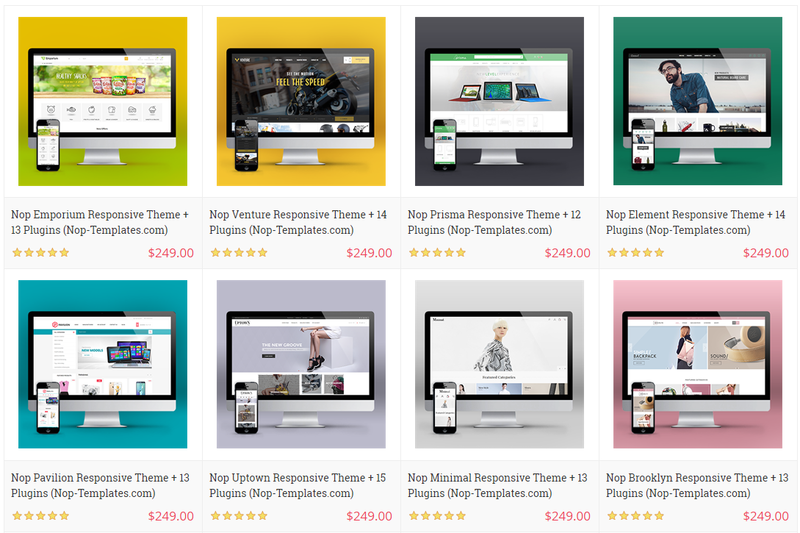 In addition, all 29 themes are responsive and compatible with nopCommerce 4.10. However, keep in mind that even if you purchase a high-end theme, you may still need to purchase additional plugins. The good news is that there are plenty of extensions on the nopCommerce marketplace. You can find a plugin for almost anything - checkout enhancements, order fulfillment, discount and promotions management, content or product management, remarketing, abandoned cart recovery, SEO, email automation tools like Storakle, and much more. In addition, if you cannot find a plugin that meets your requirements, you can always turn to a certified nopCommerce expert. Be it a .NET developer, or a recognized nopCommerce partner, they can build a custom solution for your store. Some of the best nopCommerce experts include Nop-Templates, DotControl, Irvine Software Company, Aperture Labs, and more. NopCommerce partners with more than 150 of the world’s leading .NET development companies, design companies, digital agencies and hosting providers. Whether you need a small theme tweak, a full-blown customization of your storefront, or a custom plugin, you can find a partner who will do an outstanding job. Solution partners - You want to redesign your website? You need to add more advanced functionalities to your store? Or, maybe you want to outsource digital marketing or project management? In this directory, you can find more than 130 certified professionals who can help you. Technology partners - Payment modules, tax compliance solutions, marketing tools, delivery tracking software… you name it. They can offer it. Official hosting partners - Not sure where you should host your nopCommerce store? Look no further than this directory and the list of hosting companies that have been approved by nopCommerce themselves. Everleap and A2 Hosting, for example, are such companies. You can download nopCommerce and start developing on the platform for free. If you purchase a theme or a commercial extension from the nopCommerce marketplace. If you work with a certified nopCommerce expert on a project. If you host your website in Microsoft Azure. If you want to remove the nopCommerce copyright from your website you will have to purchase the copyright removal key. If you need support from the nopCommerce team you will need to purchase one of their premium support plans. NopCommerce offers free forum support for all store owners, developers, and .NET enthusiasts. However, if you need dedicated support from the nopCommerce core team, you will have to purchase one of their premium support plans. However, it does not mean that nopCommerce will offer you support for any themes and add-ons developed by their partners. In this case, you will have to turn to the vendor who developed the theme or the add-on. Who is nopCommerce suitable for? If you’re searching for an open-source .NET based e-commerce platform, nopCommerce is an extremely viable option - it sports amazing built-in features, it is fully customizable, and it is one of the most cost-efficient choices out there. In addition, developers can use the latest ASP.NET CORE technology to create highly sophisticated e-commerce websites. However, this does not mean that you have to be a .NET wizard in order to build your online store on nopCommerce. NopCommerce is strongly supported by its community and partners. There are hundreds of certified professionals you can work with. All of them offer installation and store set up as part of their services. So, no matter what you need and how tech-savvy you are, they have you covered! If you want to get started immediately with nopCommerce, check out this Step-by-step guide on installing nopCommerce. 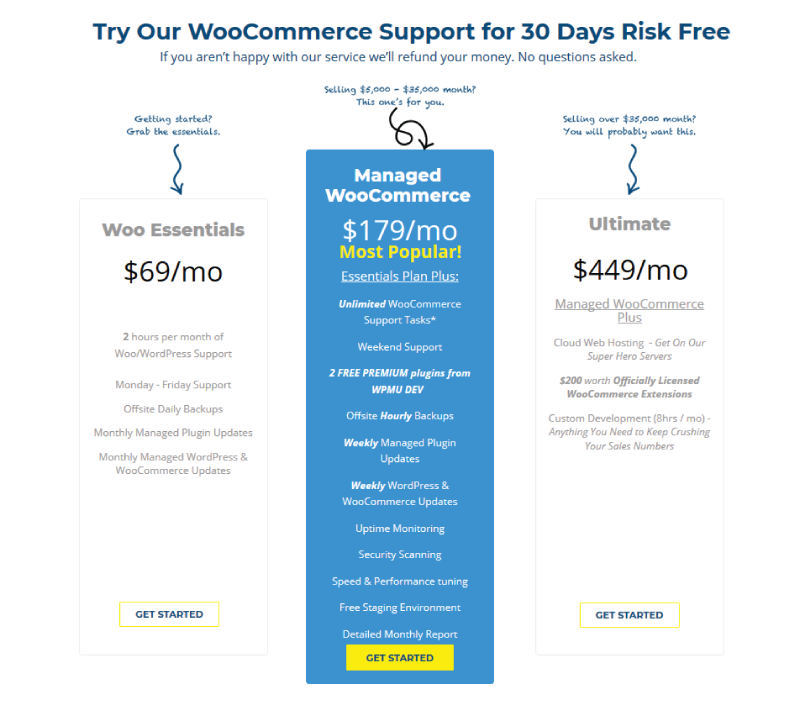 Note that WooCommerce is not your typical e-commerce platform. To be exact, it is a free e-commerce plugin for Wordpress CMS. * If you want to have more than one store, you will have to purchase WooCommerce Multistore. The price of a single network license is $199. If you need a license for more than one network, the price is $299. ** If you want to allow multiple vendors to sell their offerings through your WooCommerce store, you will need to purchase an extension. There are themes that offer multi-vendor support as well. Or, you can work with a certified developer who can add such feature to your store. In any case, there will be additional costs. PHP based. WooCommerce was developed for WordPress CMS which is PHP based. WP REST API. WooCommerce can be seamlessly integrated with third-party systems through its API, which allows for the viewing, creation, removal or update of all WooCommerce entities like products, customers, orders, etc. Note that you must be using WooCommerce 2.6 and above and WordPress 4.4 and above. Built-in CMS features such as email templates, SEO tools, ability to add products to blog posts, and more. Advanced inventory management module enables you to easily track stock levels, hold stock when an order is canceled, hide out-of-stock items, and more. You will also get notifications for low-stock and out-of-stock products. Multi-currency support. You can set the currency of your store according to your geolocation. Fast checkout options including anonymous checkout. Note that similar to nopCommerce, WooCommerce does not offer one-page checkout out-of-the-box. Instead, you would have to buy an extension if you want to add such feature to your store. Tax configuration with geolocation support. The customer's geolocation can be taken into account when the tax is calculated. Multiple payment options including credit card, PayPal, Stripe, cash on delivery, and more. Unlike nopCommerce, the WooCommerce themes page offers only the official Storefront theme including 14 child themes. The child themes are specifically designed for different industries. Say, you sell office supplies - there is a child theme specifically for this. Same goes for arts & crafts supplies, organic foods, pet products, jewelry, video games, books, toys, high-end hardware, pharmaceuticals, home decor, and clothes. If the Storefront theme is not what you are looking for, you can also purchase a WooCommerce theme for your store from ThemeForest. The WooCommerce theme category consists of more than 500 themes. If you’re looking for bells and whistles for your store, the WooCommerce plugin directory should be your first and last stop. It is where you can find a variety of free and commercial extensions. Product type. Besides physical and digital products, with these extensions, you can sell more complex product types such as subscriptions, bookings, and appointments, for example. Inventory and fulfillment. Extensions that can help you manage stock levels, orders, and returns. In addition, there are extensions that connect your store to Amazon FBA, print invoices and automatically send emails to your dropshipping partners. Cart and checkout features. With the extensions from this category, you can add a one-page checkout feature to your store, enable social login, and many more. Payments. Stripe, Square, PayPal, 2Checkout, and 8 more pages of payment gateways are available in this category. Social. In this category, you can find extensions that integrate your store with Facebook or Instagram. Email. Here you can find integrations with MailChimp and Conversio. You can also find extensions that help you streamline the process of following up with your customers and more. Reporting. Here you can find apps that integrate your store with Google Analytics and KissMetrics. You can also find plugins for customer tracking and segmentation and many more. In addition, if you’re using the Storefront theme, you can purchase the official Storefront Powerpack Bundle that consists of 13 extensions such as mega menu, blog customizer, reviews feature, and more. 6 of the extensions are free. The price range of the commercial ones is from $19.00 to $59.00. WooCommerce has listed 16 companies on their official partners page. MailChimp, PayPal, Amazon, Stripe, BlueHost, and Klarna, to name a few. Please note that these are only integration partners. Currently, Woocommerce is not looking to add new companies to their partner network but you can still contact them and discuss a possible integration between your service and WooCommerce. In addition to the integration partners, there are experts that provide services on top of WooCommerce. These companies provide a wide range of services like theme and extension development, SEO and digital marketing, etc. However, if you cannot find a suitable partner to work with, you can always work with a WordPress partner or contact an experienced PHP professional. After all, WooCommerce is open-source - everything is fully customizable. Any good developer can do wonders with an access to the source code! 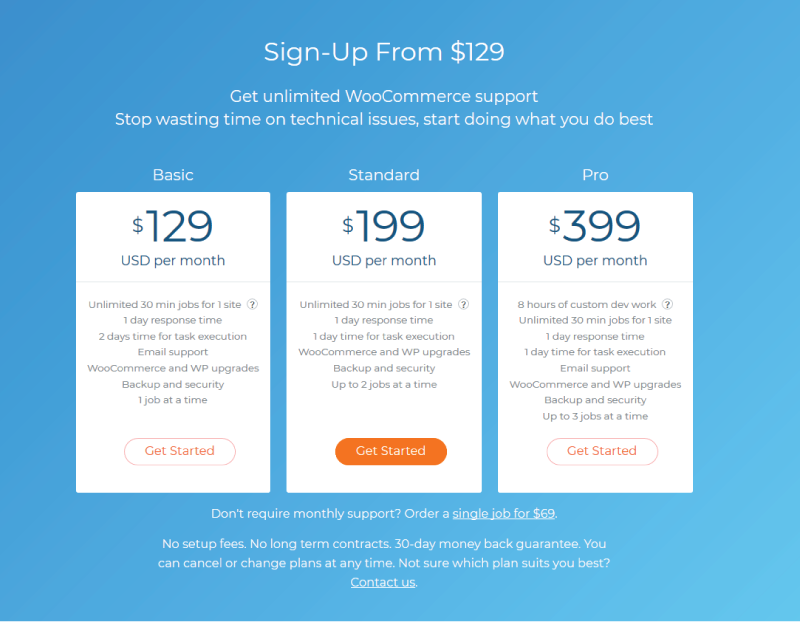 Even though WooCommerce is a free plugin, additional costs are inevitable. At the very least, just like with every open-source e-commerce system including nopCommerce you will need to pay for domain registration and hosting. If you purchase a premium theme for your store. If you decide to add more advanced features to your store, you may have to contact a PHP developer or purchase a paid extension. If you want to optimize your marketing or SEO efforts, for example, you may need to add MonsterInsights, Yoast SEO, MailChimp, or another plugin to your website. If you need premium support for your store. Who is WooCommerce suitable for? Ultimately, if you already have a Wordpress website and are just now considering the possibility to sell products online, WooCommerce is the most viable option. If you are an experienced PHP developer (or work with one), it could also be a good idea to choose WooCommerce over other PHP platforms, such as Magento and OpenCart, for example. But this is a topic for a different comparison article. 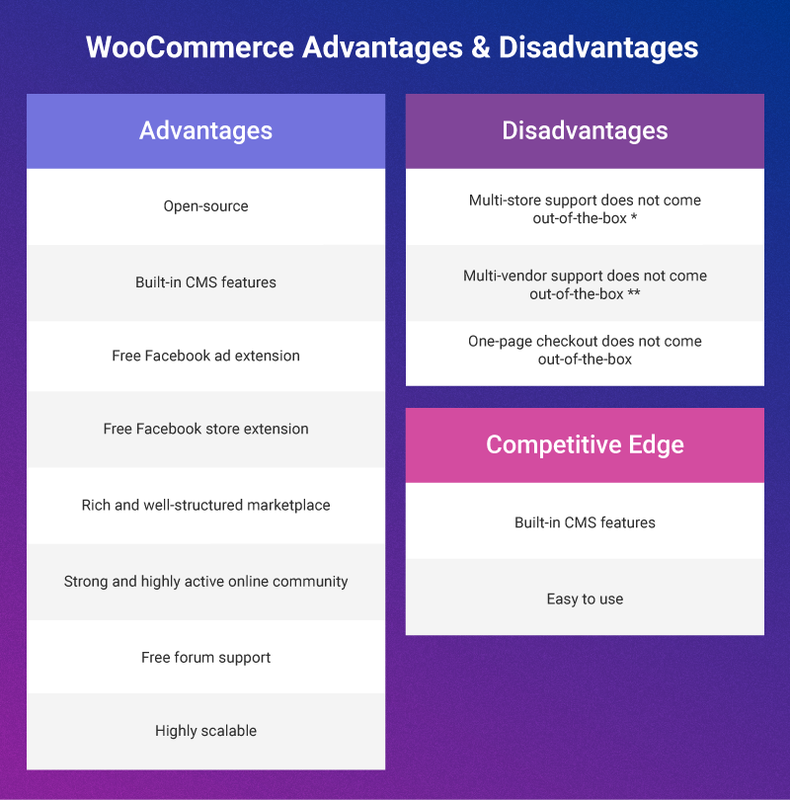 For now, let’s move on to the last section of the nopCommerce vs WooCommerce comparison - a compact table that summarizes some of the essential information we discussed above. Choosing the right e-commerce platform to build your online store on is key to your success. But it is also a very complex and time-consuming task. To make it easier for you, we have covered the basic differences and similarities between nopCommerce and WooCommerce. 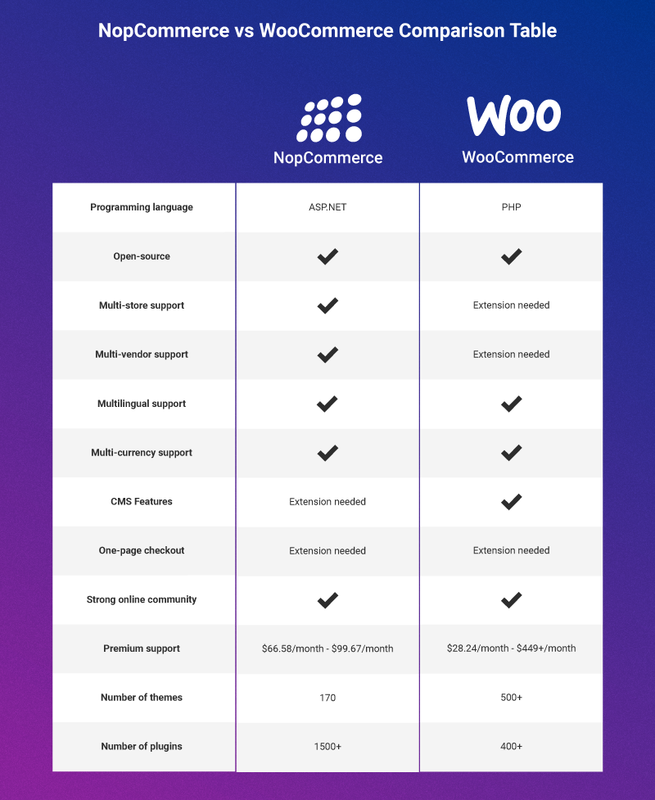 To sum up, the biggest difference between nopCommerce and WooCommerce is the programming language the platforms are built on - nopCommerce is .NET based, while WooCommerce is PHP based. Other differences include the fact that WooCommerce has built-in CMS features, whereas nopCommerce store owners will have to purchase an extension to add such features to their stores. On the other hand, nopCommerce has multi-store and multi-vendor support out of the box, whereas WooCommerce doesn’t. If you want to add such features to your WooCommerce store, you will need to purchase an extension or a theme that supports them. 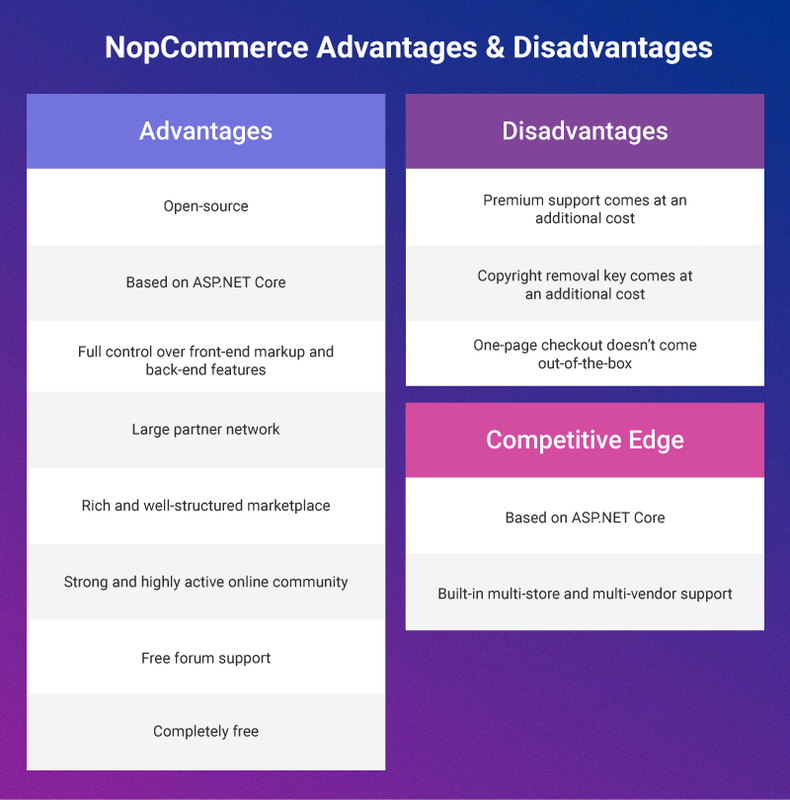 The most significant similarity between nopCommerce and WooCommerce is that both platforms are open-source and are strongly supported by their online communities. 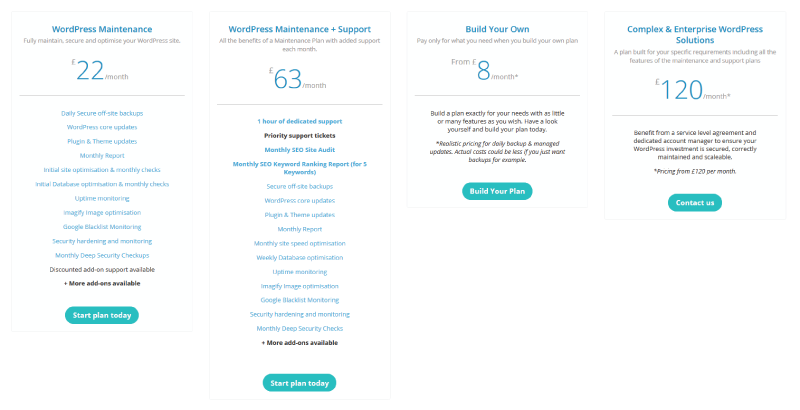 In addition, both platforms can offer you a wide variety of themes and plugins that can help you extend your website’s capabilities. We hope you found this information helpful! Do you think we missed something? Let us know in the comments section below!